Recent release “Great Basin Magic in Imagination of Words” from Page Publishing author Dean Stitzel is an extraordinary book that shows the challenges experienced by those who live in a small town and narrates how a community gets united in good and bad times. Dean Stitzel, a retired operator of a cattle ranch in northeastern Nevada who is passionate in riding and training good cow horses, has completed his new book “Great Basin Magic in Imagination of Words”: a meaningful work that tells a story of people who are able to know the meaning of freedom, respect, compassion, pride, and the challenges one faces when living at the West. Published by New York City-based Page Publishing, Dean Stitzel’s new book is a unique story on the magic of the Great Basin that touches lightly on race, religion, freedom, different cultures, among others. The Great Basin has taught many people on the importance of freedom and maintaining a culture. 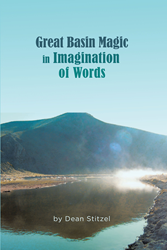 Readers who wish to experience this enlightening work can purchase “Great Basin Magic in Imagination of Words” at bookstores everywhere, or online at the Apple iTunes store, Amazon, Google Play, or Barnes and Noble.